As promised here are some more recipes if you are suffering from post baby lactose intolerance. Next week we will look at Nappy Rash – how to avoid, treat and recognise it. This sauce is a lovely base for cheese sauces, pasta or vegetable bakes or lasagnas. Use your imagination and your appetite to turn this béchamel sauce into many family favourites. Have the milk in a jug or ready to pour from the container. In a heavy based pan over low to medium heat, melt the butter or oil with the flour. Use a whisk to stir until it comes together and bubbles but does not brown. Turn the heat to low and slowly pour in the milk whilst whisking. It may look like it is clumping, but just keep slowly pouring in the milk and whisking all the time until it is smooth. Once you have half to three quarters of the milk in you can add it faster. Turn the heat up to medium and cook at a gentle simmer for 5 minutes, stir to stop it sticking. Taste to test the flour has cooked out and you cannot taste raw flour. Season with sea salt, ground white pepper and nutmeg if you desire. At this point you can take it off the heat and pour into containers to freeze for when you need it. Or you can use straight away. If keeping in the fridge for a day or two, place cling wrap on the surface to stop a skin forming. When defrosting do so gently: warm in the microwave or carefully on the stove. Or use cold and reheat as the dish you use it for cooks (eg topping lasagna). *As butter is mostly fat you may be able to tolerate it. Alternatively you can use Ghee, which has had all of the milk solids removed or you can use oil. Here are some recipes using the basic béchamel sauce as a base. A favorite when I worked as a chef, I have adapted the recipe to be made low fat and without cream. Soak the saffron in the white wine while you cook the rice, pasta or mashed potatoes. Sauté the garlic in oil and add the prawns. When they start to colour add the wine and the béchamel. Stir to combine well and allow to come to a simmer so the alcohol cooks off. If the sauce is too thick add chicken stock, more wine or water. Season with sea salt and pepper to taste and add the finely chopped parsley, off the heat. 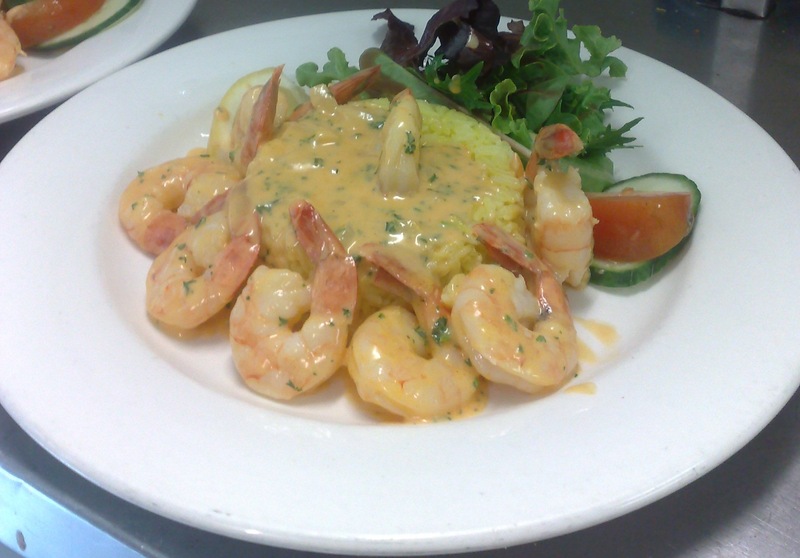 Serve the prawns with rice and salad. If you like your vegetables very tender: cook them first and place in a casserole dish. I like mine just cooked so place in the dish raw. Mix half the cheese with the sauce and pour over. Sprinkle over the rest of the cheese. Bake until golden and the veggies are tender. This batch of béchamel is more than enough for two generous dishes of vegetables. I like to make two lasagnas or vegetable dishes and freeze one uncooked – to just pull out for an easy dinner. Cook the pasta to packet directions. Sauté the garlic in a pan with sliced ham, pancetta or thinly sliced smoked tofu. Add the sauce and extra milk or water to thin it to the right consistency before tossing with the drained, cooked pasta. Great served with pasta or even with mashed potatoes and vegetables or simply over steamed veggies for a very healthy but indulgent tasting dinner. Sauté the sliced onions and mushrooms in oil or ghee. Add the beef and brown slightly. Stir in the sauce and enough stock to thin to a coating consistency. Season to taste with the lemon juice, dijon mustard, sweet hungarian paprika, black pepper and sea salt. Serve over pasta, rice or mashed potatoes. Problem: soy and other non dairy milks may curdle when you put them in coffee or tea. Reason: tea and coffee are acidic, the stronger the drink the more acidic. Solution: put the milk in the cup first, more than you may normally use, and pour in the coffee or tea slowly. If it does curdle I actually find it still tastes fine and I just drink it while stirring before a sip. Solution: Freeze it in smaller containers the day you open a long life milk or the day you buy a fresh milk. I use small glass juice bottles and fill 3/4 full so the bottle does not shatter. To defrost either do so in the fridge overnight or place in a flask filled with hot tap water and after 10 minutes shake vigorously to break up the ice crystals and cool the milk that warmed on the outside. If you have any problems you would like help with, just ask in a comment. As a qualified chef I should be able to help. Next week the fun topic of a rashy baby bum, and how to keep yours as smooth as a baby’s bottom aught to be. Tags: allergy, dairy, food, hazelnut cream, lactose, post baby, pregnancy, vegetarian, weight loss. Bookmark the permalink.